Today was a rough day for my little monkey. He has hardly smiled and did not really nurse much. Late this morning I saw just how miserable he was when he cried he wanted to eat, but was in too much pain. I gave him Motrin and after a while he fell asleep from crying so much. JSL just was not his happy, smiley self. These photos were taken Saturday night just before we realized he had a fever. He’s playing with one of his favorite toys. This is the Sesame Street Atom that Uncle I bought for NHL when he was first born. It is a really great toy for babies to play with when on the floors rolling around, or to practice sitting up with. 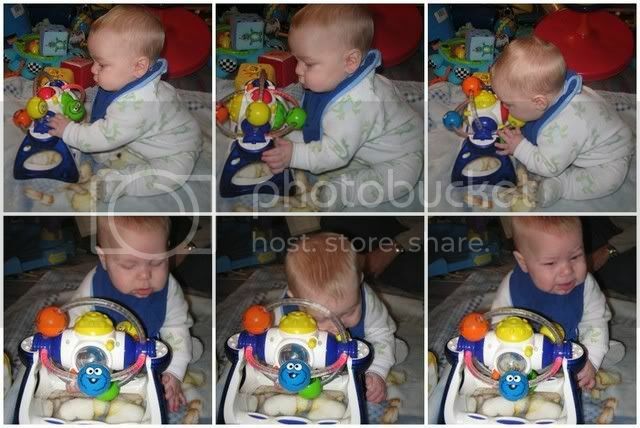 As you can see, JSL has gotten VERY good at sitting up on his own, even while playing. You will also note he quickly bends in half to try to eat said toy. Ah, the joys if teething! Tomorrow we just hope not to visit our doctor to have him checked. Tonight was 48 hours since he started the antibiotic, so maybe we will be on our way to being healthy. If things go well my plan is to head to NHL’s school tomorrow to watch his swim lesson. If not we will head to the doctor and take care of preliminary packing to visit Uncle I, Aunt M and to meet Cousin S this weekend.